A.J. Worldwide Services Inc. Joined FNC- Group. A.j. Worldwide Services Inc, established in 1994, is a leading global freight forwarding service provider headquratered in Secaucus,NJ with offices in London. A.j. Worldwide Services Inc Certified with IATA, FMC and NVOCC. We are a Global Freight Forwarding Company with headquarters in New Jersey, USA. We are determined to satisfy the increasingly sophisticated needs of International Trade by offering customized solutions seamlessly through our worldwide agency network. A.j. Worldwide Services Inc. 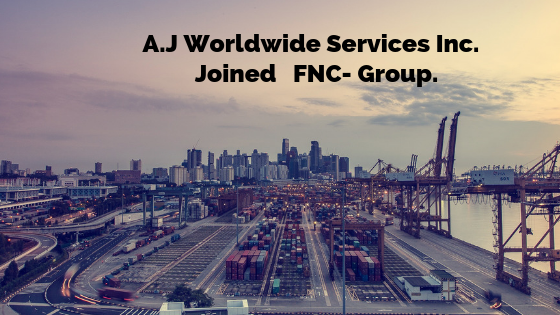 Joined FNC-Group on 11th Feb 2019….FNC-Group and All team Congratulating the A.J worldwide Services. Mr. Berk Namoglu is the Key Contact person of A.J worldwide services inc.